For this first time ever, Fletcher Hanks's mad masterpiece, Stardust the Super Wizard, is available as a limited edition, hand painted polyresin figurine! 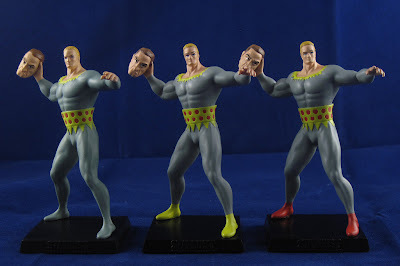 Sculpted at 1/21 scale and standing 4.3" tall, Stardust is the first in a new series of figurines devoted to selected superhero, science fiction and horror characters from the Golden Age of Comics. This collection is designed to complement the existing series of Marvel and DC superheroes produced by Eaglemoss of England. Only 180 pieces of this Edition have been produced; the Yellow Boots Edition (75 pieces) and the Red Boots Edition (45 pieces) are also available here on Amazon. Each variant has its own label, is individually numbered, and comes in a custom full color box. Fletcher Hanks was a mysterious Golden Age cartoonist whose output has been described as "Basil Wolverton meets Ed Wood." His comics were crude, surreal and instantly recognizable, earning him a cult following among fans of lowbrow art and offbeat vintage comics. Hanks' bizarre body of work has been collected in two excellent books by Paul Karasik, "I Shall Destroy All the Civilized Planets!" and "You Shall Die By Your Own Evil Creation! ", both published by Fantagraphics. 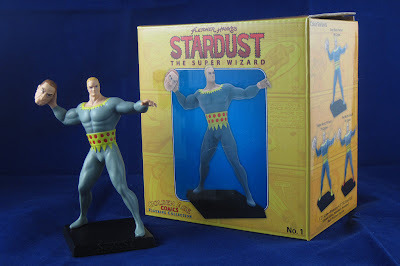 Stardust the Super Wizard is probably Hanks's most well known character, a towering godlike alien with an observatory on his own private star. Besides his near invulnerability, Stardust possesses a wide range of powers, including an improbable arsenal of rays and the ability to change his size and shape at will. 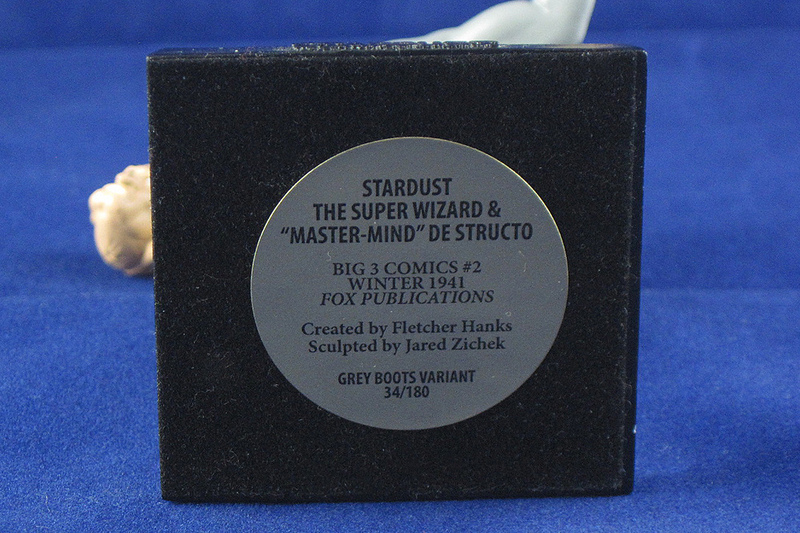 This rendition of Stardust is inspired by "De Structo & the Headhunter," a story featured in Big 3 Comics #2 published by Fox Publications in the winter of 1941. It depicts Stardust preparing to hurl the enlarged head of De Structo into a "space pocket of living death," the home of a giant "headless headhunter" who will consume the hapless villain. An unusual piece which will stand out in any collection of comics memorabilia. 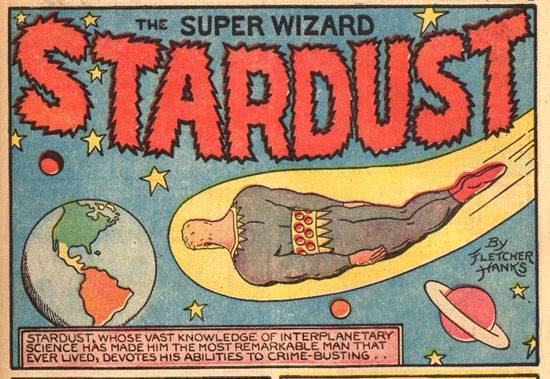 If you are unfamiliar with Stardust or his creator, here is some background: Fletcher Hanks was a mysterious Golden Age cartoonist whose work has been described as "Basil Wolverton meets Ed Wood." His comics were crude, surreal, violent, and instantly recognizable, earning him a cult following among fans of lowbrow art and vintage comics. Hanks' bizarre body of work has been collected in two excellent books edited by Paul Karasik, I Shall Destroy All the Civilized Planets! and You Shall Die By Your Own Evil Creation!, both published by Fantagraphics. Stardust the Super Wizard is probably Hanks's most well known character, a towering godlike alien with an observatory on his own private star. When his "crime-detector" alerts him to an evil plot unfolding on Earth, he flies to our planet in his "tubular spacial" to unleash his peculiar brand of justice on evil-doers. Besides his near invulnerability, Stardust possesses a wide range of powers, including an improbable arsenal of rays and the ability to change his size and shape at will. He regularly seizes his opponents in a crushing, vise-like grip before administering some bizarre form of punishment that is frequently fatal to the recipient.